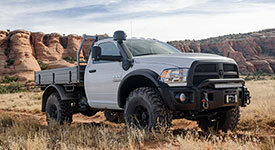 Now get AEV’s highly-engineered custom lift for all Ram 1500 Rebel and Air Ride-equipped models. AEV’s 4” DualSport Air Ride Suspension maintains the outstanding features and function of the stock Air Ride suspension for Ram 1500—all while increasing ground clearance off-road, preserving excellent handling on pavement, and making room for larger tires. As with every AEV DualSport Suspension, AEV has invested countless hours of development time and OE-level testing to innovate the highest quality aftermarket lift kit for Ram 1500’s Air Ride IFS suspension. 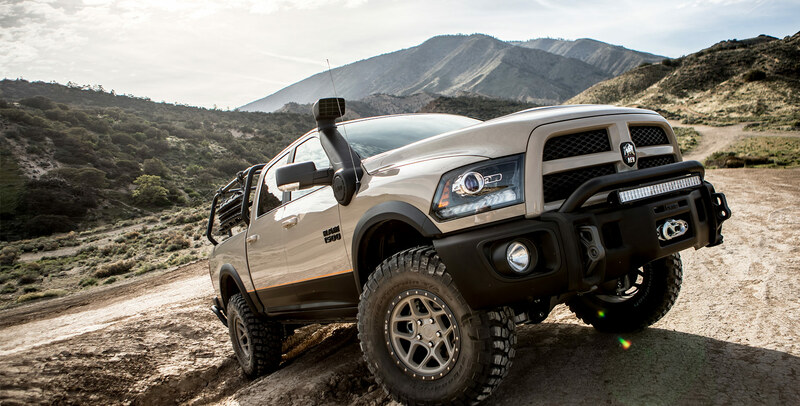 AEV components seamlessly integrate with the high-performance IFS Air Ride found on 2013-18 Ram 1500/Rebel models, retaining the OE front air struts and rear airbags to preserve factory ride quality and automatic/manual height adjustment functionality. Suspension steering and geometry are maintained and enhanced on the lifted vehicle with AEV’s innovative military grade A206 T4 aluminum tall steering knuckle and CNC aluminum front driveshaft spacer, rear geometry correction and upper control arm brackets, and custom-tuned Bilstein 5100 rear shocks. Vital undercarriage protection on rocky trails comes from a 4mm thick contoured stamped steel skid plate. For maximum performance, AEV recommends 35” tires for this suspension system. Add the optional AEV ProCal Module, which adjusts the vehicle’s speedometer when running larger-than-stock tires. Designed and Engineered with the Overlander in mind, AEV’s all-new 4.5″ High Capacity Coil Springs are a direct fit upgrade for customers with an AEV 4.5″ DualSport SC/RS Suspension System. These frequency-tuned, progressive rate coil springs provide the increased load carrying capacity necessary for heavily loaded vehicles, while still offering exceptional ride quality, handling and off-road articulation.